Hydrocollator™ Heating Units are self-contained and thermostatically controlled to maintain temperature at 168°F, so no plumbing is necessary. Simply fill unit with water and plug in. Stainless steel. Each unit comes with standard size steam packs, 10" x 12". Choose either mobile or stationary unit. 120V. Deluxe Mobile Unit has 1500 Watts, all others are 1000 Watts. UL and CSA approved. Order side table rack for extra storage. 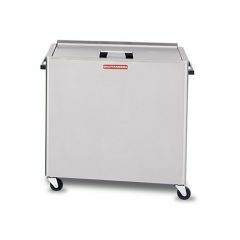 Mobile Deluxe - 24 packs - size: 20" x 32" x 33" tank: 16" x 28" x 18", 165 lbs. - 1500 Watts. Mobile Economy - 8 packs - size: 15½" x 21" x 31" tank: 12" x 14" x 17",80 lbs. - 1000 Watts. Side Table Rack - size: 13¾" x 30" x 20"